Since ancient times, the island of Rhodes has been called the Island of the Sun God with good reason! With over 3000 sunshine hours each year, it is one of the sunniest regions in Europe. 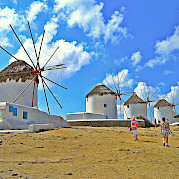 On this bike and boat tour in Greece and Turkey, you will explore Rhodes and the neighboring islands in the Dodecanese group. Let yourself be mesmerized by this exquisite place with it's sandy, pristine beaches and history dating back to the Byzantine era. The landscape is varied and ranges from arid and rocky to lush and forested. The island of Nissyros, located between Tilos and Kos, is famous mainly for its volcano but is ideal for a quiet and relaxing vacation. You will discover the Castle of Spiliani, the villages, and pebbled beaches, as well as the thermal springs of the island on a journey full of blue and white. Impressive is the towering volcanic crater of Nissyros or the charm of Symi, the island capital, with its wonderful neo-classical buildings. Follow the tracks of the midget elephant on the island of Tilos which fortunately hasn't lost its tradition and character. You will be enchanted with the picturesque port of Chalki and fascinated by Aegean history, mythology and legends as you hear the stories of the rock throwing Poseidon, the Colossus of Rhodes, the Knights of St John and the famous sponge diver of Symi! A comprehensive list of all of our bike boat tours in Greece can be found here. *Private transfers available as well. Please ask us for pricing. Fly to Bodrum Airport, Turkey. Please note: At this point in time many travelers are skeptical about flying into Turkey. Therefore, this tour offers an alternative flight route via Kos Island, followed by a ferry connection to Bodrum harbor. Organized transfer is available on arrival and departure days. See pricing. Please check local conditions before your arrival. Average daily high/low temperatures in degrees F for the area are: April, 67/56°; May: 74/62°; September, 81/71° and October 75/65°. Bike helmets are available on board in limited number on request. 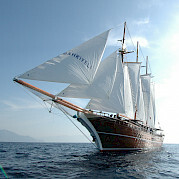 Our tour in the South Greek Aegean will start from Bodrum. In order to avoid any travel complications whilst crossing the borders, we request that all participants register for the appropriate travel documentation and visas with their local embassy before arrival on site. Moderate to difficult, guided bike and boat tour with daily distances averaging approximately 25 miles (40 km). Route will take you through partly hilly and mountainous terrain. There will also be extended climbs but walking your bike is of course permitted. Most of the roads are asphalted. Your tour guide will inform you each day about your tour details. You can set aside a whole day or half day for swimming or relaxing on board. Beverages on board (tally sheet). Individual arrival to Bodrum harbor. A collective transfer from Bodrum Airport to the harbor is available for an extra cost, on request. Check in begins at 2 pm. Alternatively, you can fly to Kos Airport and take the ferry across to Bodrum for check in. If you choose to arrive via Kos, make sure that your flight arrives no later than 2 pm in Kos in order to catch the ferry connection. Use the evening hours to enjoy the lively vibe in the city of Bodrum and relax with a typical Turkish tea. In the evening, a group dinner on board can be enjoyed in the company of your travel companions and tour guides. The first cycle tour of the week takes you to Kızılağaç, which is famous for its local farmer’s market. After a break, continue cycling to Yalıçiftlik. Board the boat for lunch and a cruise to Kos town. An entourage of cultural sights in Kos town will give you insight into the town’s turbulent historical past: The Roman Forum, the Crusader fortress, and the mosques from the time when Kos was still part of the Ottoman Empire. The evening is rounded off in one of the numerous bars and cafes. 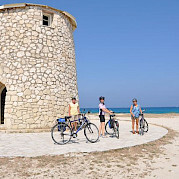 Cycle in the direction of the world famous archaeological excavation site of the Asclepion in Kos, the former realm of Hippocrates, the father of modern medicine. From here, cycle along the coast back towards the town of Kos. Here we board the boat and cruise to the volcanic island of Nissyros. Begin in the morning with a cycle tour to Nikia - a village built directly on the Stefanos crater rim at 1,400 ft./430 m above sea level. From here, enjoy a fascinating view into the volcano crater. The white houses and the numerous pebble mosaics bring great character to the village. From here, cycle on to the crater with its steaming sulphur springs and finally back to the small port town of Mandraki where the boat awaits to take you to Tilos Island, inhabited since ancient times. The morning bike ride takes you from Livadia to Megalochorio. Enthusiasts can visit the pygmy elephant museum before returning back to the boat. A tasty lunch awaits you on board followed by a relaxing cruise from Tilos to the island of Chalki. In the morning, the boat crosses to Panormitis Bay in front of the island of Symi, where the local monastery offers us a pleasant visit. After, follow the motto “off to the other side of the island!” Scaling several switchbacks, slowly conquer the hill, allowing yourself enough time to enjoy the picturesque views on the way up. Today's destination is the Islands capital of Symi, with its classical cityscape and harbor. In the evening, you can climb to the upper part of Symi town. From the top, enjoy a breath-taking view over the harbor and the coastline of the bay. An evening visit to a remote tavern enables you to enjoy the evening away from the hustle and bustle of city life. From Symi, make your way to the neighboring, Datça Peninsula. Today’s bike tour takes you from the Datça district along the peninsula to the historical ruins of Knidos (4th Century BC) with a wonderfully preserved amphitheatre. A stroll through this historical site leaves a lasting impression. Depending on the departure times of the guests on board the following day, you can either spend the night in Knidos or cross over to Bodrum. An evening meal is enjoyed together in the company of guides and guests. After breakfast, you disembark. Fee-based collective transfers to Bodrum Airport on request. If you wish to fly home from the Island of Kos, your ferry will depart at 9:30 am. Please ensure that your flight departure from Kos is no earlier than 1 pm. Want to see more? View all of our featured bike and boat tours, or our full list of bicycle tours. Most everything was perfect, especially our guide Lars for both trips. Only problem was lack of AC on boat so sleeping not easy. My first time on Greek Islands and this trip was superb. Our guides, Ali and Peter, were always available on the boat or the bike route to respond to our needs(which were few beyond what was already provided). The airport transfers were very helpful facilitated with cheap internal Turkey flights; we used Atlas Air. The weather was very hot in late August but we had lovely cool swims off the boat at the end of our rides. The steep Greek island hills were tamed with electric bikes by many of the riders. All the bikes were good and well maintained. Our room on board was spacious, had lots of storage space and a large bath. The boat chef gave us delightful fresh Mediterranean cooking on board; one meal a day on shore offered local food experiences. We really enjoyed the international mix of riders. I would go with Island Hopping again without hesitation.